I contacted Allison Runnalls after a doula friend highly recommended her. There was no need to meet with any other doulas. Allison instantly made me feel supported, that I could take charge of this birth and even heal from my daughter's traumatic birth. She knew what I needed to feel safe and in control this time around. Her vast knowledge of anything pregnancy and birth related helped ease any worries throughout the pregnancy and she was always a text, email or phone call away. She was my side kick through several hospital visits informing me of my choices that I didn't even know I had and she always had my back no matter what I chose to do. Labour was fast and furious but with Allison by my side, breathing with me, riding the contractions out, knowing what I needed without me saying anything, I felt strong and in charge. I knew she had my back and I could just focus on what she was saying and listening to my body. Without her, I wouldn't have had the healing birth that I had..including catching my baby and loving this new little person without interruption after the birth. I will be forever grateful for what Allison gave me to heal and to welcome my second daughter into the world. 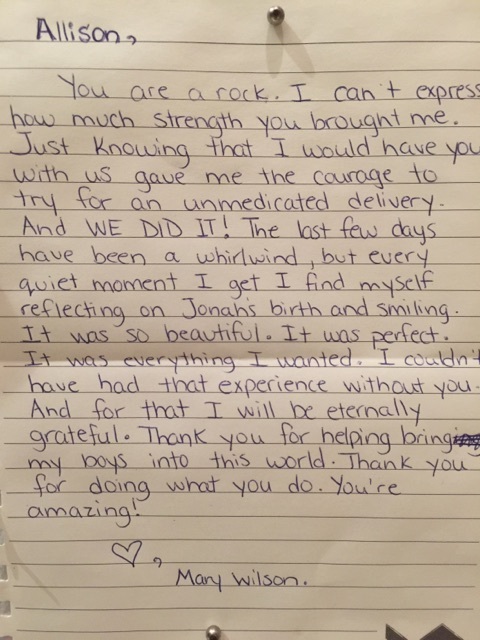 Having Allison as our doula made our birth process a very personal, special and unique experience. Having some anxiety about becoming first time parents my husband and I felt that we needed as much guidance and support available to us. Allison did a tremendous job providing us with resources and information to help us prepare our so-called "birth plan". She was very practical and realistic about the labour and delivery process. She also provided us with important topics to learn or, at least discuss and review in order to be somewhat prepared. She even demonstrated some pain management techniques during our initial meeting. Allison cleared her schedule and made it a priority to come assess our birth situation when the time became necessary. 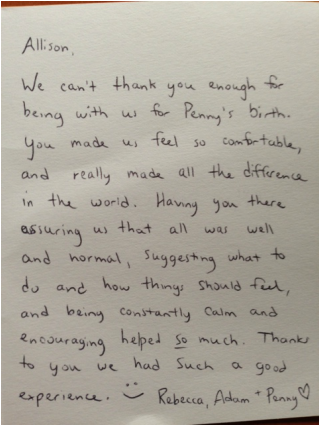 As our "planned" hospital birth became and "unplanned" home birth she helped keep my husband calm and guided him step by step through the entire process. She made time to follow up with us after the birth. She also utilized this time to squeeze in some breast-feeding issues and offer me some helpful tips. I recall that she was also readily available to answer my burning questions or emails. I would describe Allison as very; approachable, informative, resourceful, non-judgemental, open-minded, and passionate. She seems very dedicated and devoted to her clients being readily available at the drop of a hat. Heartwarmingly, I just have to also note that along with having an unplanned home birth, my husband and I were so focused on the "process" that, we never took a single photo until after our daughter was born. Unknowingly, Allison took many photos of our entire birth experience. It was so amazing, touching and unexpected of her. We will be forever grateful to have these captured moments and especially, for her being a part of it all. 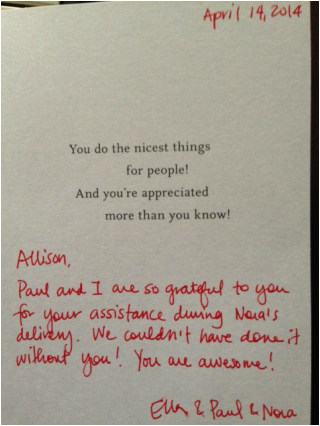 I cannot express our gratitude and appreciation for Allison G Runnalls with Doula On The Move enough. Numerous nights until 3 am trying to move the baby , numerous positions and ideas to try and get this little guy in place and ready to come out , with a smile on her face and the energy of a 6yr old on Christmas morning when we were falling asleep. A happy , perfectly healthy baby , born naturally with a coach way better than I could have ever been even in my dreams. I personally cannot thank you enough for all the wisdom you shared, the effort you put forth and the energy you gave us (more so mel ) when we needed it the most. It is obvious you love your job and I believe that love is so important for this part of our lives , you have found a perfect fit for where you are needed. You will always be a part of this experience . Words cannot express how grateful I am to have had Allison with us for the birth of our son! She went above and beyond our expectations. I wasn't too sure if a doula was right for us as we're very private people, but am so happy we made the decision. I couldn't imagine his birth without her. She did so much...helping us turn the baby so he was in the right position, calming us down, giving endless advice and encouragement, taking pictures, even acting as crowd control. She is a very knowledgeable, kind, beautiful person and I give her all the credit for turning a long, stressful labour into a beautiful experience. This was my third baby. I thought I knew it all and was very very in tune and in control with my body. So much so that I was able to subconsciously tune out the contractions right until the end. Because of this I didn't feel the majority of the contraction and wasn't aware of how close we were getting to baby time. She was amazing. She literally knew I was experiencing a contraction before I did! She suggested we go to the hospital on our walk instead of heading back home. I protested but agreed. If it wasn't for her my baby would have been born on a trail behind the hospital. I would never have made it. For this I will always be thankful. This woman knows a laboring woman!! She is smart, knowledgeable, kind, funny and a joy to have spent time with and get to know. 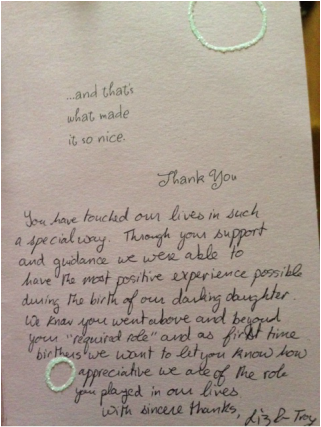 I wouldn't have chosen another doula very proud to have her. This woman right here is fabulous. There are a select few (I feel) in the birthing world that can honestly look out for your best interests from beginning to end.. Alli is one of them. She inspired me to take control and own my birthing experience. In the end, I felt so empowered by my choices and the decisions that she helped me gain the courage to stick to. I recommend her to all of my pregnant friends because she will always be ready to answer your questions and be by your side to make it YOUR birth. ﻿Allison is AMAZING to say the least. I was fortunate enough to have Alli for both of my daughters births, she was able to make this life-changing experience calm, positive and happy (which is not always the case.) It was reassuring to know that my decisions and my feelings were always validated and never judged. Alli has a wealth of knowledge in this field and is an essential asset to any woman for pregnancy, childbirth and breastfeeding (Also great at calming the husbands) <--that one is important! She is truly a gift to her profession!!! 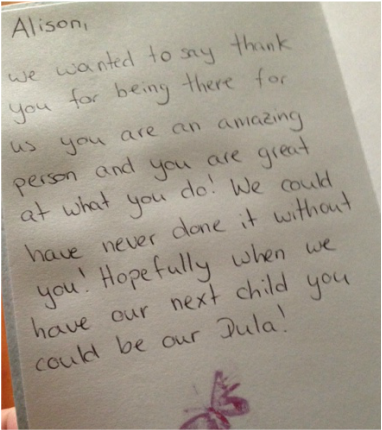 Let me start off by saying that Allison is one of the most amazing women I have ever known, let alone an amazing doula. I used her for informational assistance for my first birth and would have not been as to do my second or third birth without her. I guarantee you that she will make you feel comfortable, safe, powerful, and strong. She thinks of everything, whether you know you need something or not, she has it. My husband was also extremely grateful she was there; she knows just what to say or do to make you comfortable. She is your voice and gets your brain moving when you are in that moment that doctors are in your face pressuring you to make decisions. The other great thing is that there is never any pressure to do things one way or another, just information and pros and cons of each option. She is there for you and will make sure that you have the best experience possible. If we decide to have any more babies, there is no one else I would choose to be by our side. Allison was my doula in 2002 and again in 2004. Though the births were quite different (first slow and induced; second natural and fast), Allison saved the day (well, first birth, she was there for DAYS!) by helping us deal with the steps we were going through, and by boosting my breastfeeding confidence in the critical first days when you're just not sure you're doing it correctly. In prep for my first baby, Allison came to my home to share tips on childbirth, nursing, and we worked on a birth plan. I was your typical 'type-A' check-listed first time mom hoping for a natural labour, but my baby was 10 days late and I got camped at the hospital in an induction situation. (I was healthy tho, and biked to the hospital 7km for that stress test). Allison made sure I was OK with new plans as they were introduced over the next days, and, then, when painful labour started, she was there to check in, do massage, do more massage, explain what was going on, give my husband a break, etc. After my 6 hour epidural "nap", 3 hours of pushing, my son was born and Allison was the clever one to take the photos as the rest of us were exhausted. Allison visited us at home and gave me the best instructions ever for latch. Thank you! My 2nd birth was brief and fun by comparison, and Allison was truly Doula on the Move b/c my progress was incredibly fast (as compared to first one) and Allison provided essential guidance on pacing plus helped us laugh at the whole crazy and wonderful thing. I have recommended Allison to many friends and with good reason! Allison was instrumental in the births of all three of my children. She was the greatest support I could have ever asked for. She helped with my birth plan, and was so knowledgeable. When I was in labor she helped me get through every contraction, and the support after I gave birth to my first helped me immensely with getting a successful breastfeeding routine going. When I became pregnant with twins, she was just as invaluable as with my first. She stood behind my decision for a natural birth, and again helped me through every contraction. 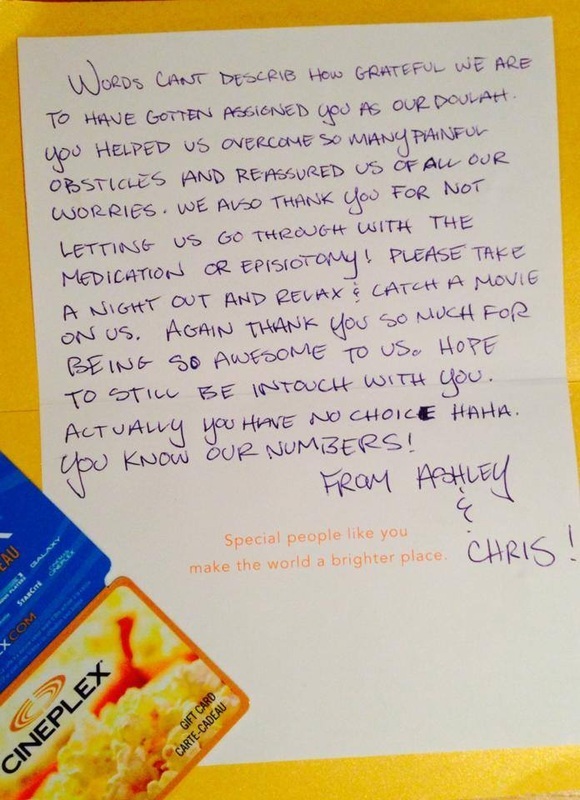 I had a somewhat pushy OB who decided I needed an epidural, but Allison respected my wishes and backed me as I firmly declined. I love that she was there for me forevery step of both my pregnancies, the after birth and lactation support, and the fact that I'm lucky enough to count her as one of my best friends. Being a doula isnt her job, its her calling, she's a natural! I just want to start off by saying that I am a very private person when it comes to things that are happening to me and Allison not only observed that on her own but she completely respected it. My experience with Allison is a little different because she wasn’t physically there when either of my children was delivered (by my choice) but she was mentally supportive for me the entire pregnancy and after. I felt that I could ask her a thousand questions at any time even if it was one every minute and she was always happy to provide explanations and suggestions. Trust me, some days it felt like a thousand questions. With my first child she was a fantastic lactation consultant! Far better than the drop in clinics they tell you to try or the home nurse. She actually explained the positioning and made me do it instead of getting him to latch her. With my second she gave me power. What I mean by that is she talked about enjoying the experience and going at my own pace not anyone else’s. This was extremely different than my first as I was induced and the whole experience seemed very “stop and go”. After the second delivery I felt like wonder woman and the first person I wanted to share that with was her. She will always tell you the information you’re looking for and let you decide then back you up 100%. I recommend her to everyone I know that is pregnant because I don’t know what I would have done without her! Allison is beautiful, amazing person. Upon finding out our baby was breech at 36 weeks, my husband who had known her prior, called her for advice. 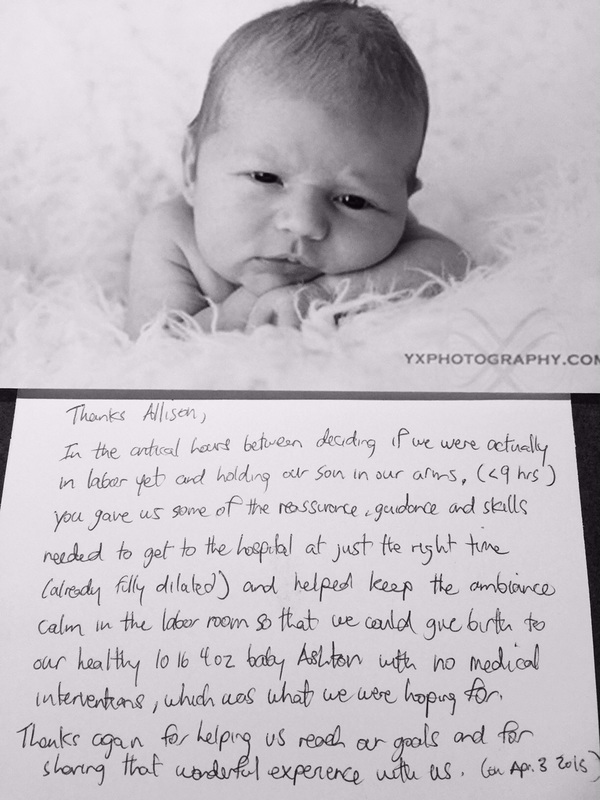 Even though it was short notice at 36 weeks, Allison offered her services to us. She had great ideas to turn the baby. We tried them, but came to the conclusion that Caleb just didn't want to turn. 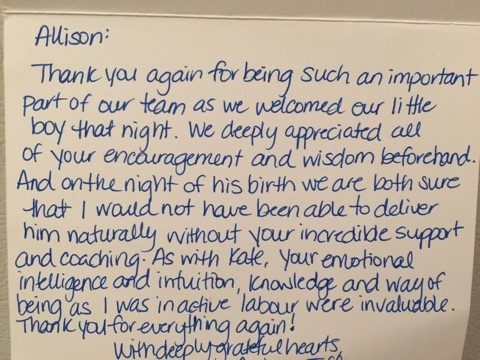 She also educated us on breech birth, and regardless of the negativity and lack of hope in the medical world, helped me to be more confident and prepared for a breech delivery. She drove out to see us on a few occasions, and on delivery day, met us at the Vancouver Women's Hospital, the only place breech delivery was possible. Had she not been there, I may not have been successful in delivering breech, as the hospital had VERY specific guidelines regarding progress and intervention. I was only given 8 hours maximum of active labor in the hospital, and was given an epidural against my will (which did not work, might I add, it was too late). 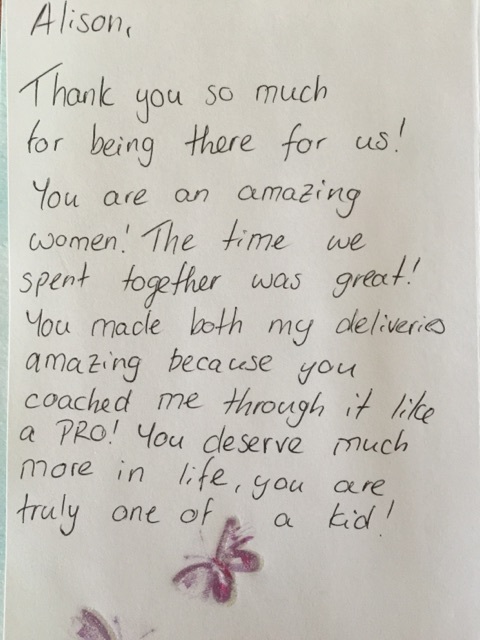 Her expertise and talent in reading my emotions, and timing my contractions; as well as her kind words of hope gave me and my support persons the hope and confidence to get through it. I dilated from a 4 to an 8 within 4 hours, maybe even less. Caleb Marcial was born by Natural Vaginal Breech delivery March 9, 2014 at 12:38 am.